Grooming is more than just a bit of pet pampering; it is an important step in keeping your pet happy and healthy by preventing disease. 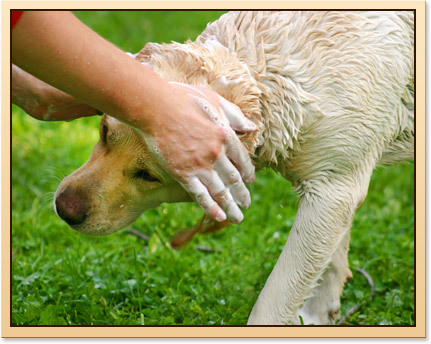 For example, regular baths and nail trims help remove harmful germs from the fur and paws that are picked up as your dog plays outside. They also provide a great opportunity to notice dried or cracked paw pads or skin issues. We also know from the many happy pets and admiring owners that a good grooming session increases pet owner satisfaction, improves your pet's sense of well-being, and strengthens the human/animal bond. This is why River Trail Animal Hospital is proud to offer full grooming with our highly experienced professional groomer. In fact, we are so certain you'll be satisfied with your pet's grooming that we're offering Guaranteed Grooming. In other words - if you're unsatisfied, your session is free. Since grooming is important to you and your pet's happiness as well as your pet's health, give us a call to set up a session today!